TALLAHASSEE, Fla. — When he left Florida State after the 2012 season, Jeff Peterson hoped to remain in basketball as long as he could. He figured his role would be on the court, but, as it turns out, life in the front office suits him better. Peterson, a point guard who played a key role on FSU’s 2012 ACC tournament championship team, has spent the last four years as part of the Atlanta Hawks’ scouting department. And the Hawks recently rewarded his efforts by promoting him to assistant general manager. A native of Springfield, Mo., Peterson transferred to FSU for his senior season after graduating from Arkansas. While enrolled in graduate courses at FSU, Peterson sought out ways to combine his interests in hoops and business. While he initially thought he might make a good sports agent, talks with a few teachers and mentors – including Hamilton – persuaded him to make a run at the front office. A connection with former Spurs and Hawks executive Danny Ferry led Peterson to Atlanta, where he earned a spot as a scout and coordinator of basketball operations. Under the guidance of Ferry, Ferry’s successor Wes Wilcox and head coach Mike Budenholzer, Peterson excelled with the Hawks at a time when the franchise enjoyed a startling resurgence. After winning 60 games and making the conference finals in 2014-15, the Hawks promoted Peterson to director of scouting. A year later, Peterson’s ascent contined to his current role of assistant general manager. Peterson’s responsibilities have taken him all over the country and the world. He evaluates collegiate and international players prior to the NBA draft, and he’ll also scout the rest of the NBA in advance of the annual trading deadline. Peterson’s favorite places to catch a game include Allen Fieldhouse at the University of Kansas and Duke’s Cameron Indoor Stadium. Although the latter has less to do with his professional life. “When I was on that Florida State team that beat Duke, when Snaer hit that shot, that was great,” he said. 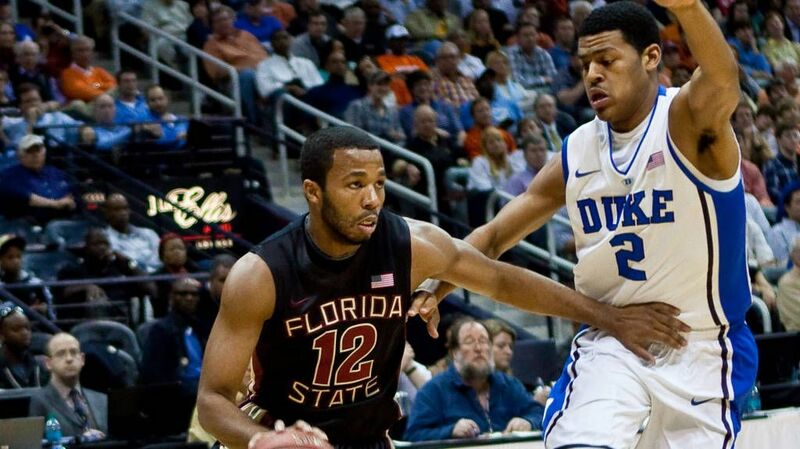 That was in 2012, when Michael Snaer drained a buzzer-beating 3-pointer that lifted the Seminoles to a season-changing win over the Blue Devils. FSU would go on to win its first ACC tournament championship and claim the program’s highest-ever NCAA tournament seed. Part of a veteran-heavy lineup that featured six seniors, Peterson averaged more than 15 minutes per game while chipping in 3.1 points per game. He also had a hand in one of FSU’s most dramatic victories of that season, as he set up Snaer for a late, game-winning 3-pointer against Virginia Tech. Peterson said he still talks regularly with his FSU teammates, as well as Hamilton, FSU assistants Stan Jones and Dennis Gates, and former assistant Corey Williams. And Peterson doesn’t need to look far for a reminder of his greatest triumph with FSU. The Seminoles won their ACC tournament title in Atlanta’s Philips Arena – the home of the Atlanta Hawks.